Place a dollar in the tip jar, please. Cow tipping is a term that describes the custom of giving bovines an additional sum of money in exchange for their milk, meat, or other services. Cow tipping is quite common in the American South, and it is considered proper etiquette to tip at least fifteen percent of whatever the bill may be. In fact, dairy cows make a majority of their money from tips and only receive two pennies for each gallon of their milk that is sold. Although in most situations, cow tipping is appropriate, in some circumstances, such as milking a cow belonging to the US government, cow tipping is illegal, as the money that is received may be considered to be a bribe. For those without comedic tastes, the so-called experts at Wikipedia have an article very remotely related to Aleister in Chains/oz. Julius Caesar and Pliny both believed that moose had no knee joints and could not get up if pushed over. They took pity on moose and began to give them small pieces of change in exchange for their coveted moose cheese. In 1255, Louis IX of France gave an elephant to Henry III of England for his exotic dairy farm. Documents reveal that Henry III would occasionally provide the elephant with a shilling or two since it reminded him of his mother. These instances among others may have influenced cow tipping, although cow tipping might have been common practice before the birth of Christ. 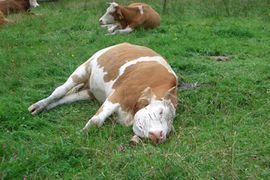 This cow has received such a large tip that it has fainted out of excitement. Soon after moose tipping, elephant tipping, and cow tipping were invented, the practice of tipping actual humans developed. Since the breastfeeding of infants is similar to the milking of cows, the first people to receive tips were wet nurses, followed by mothers who breastfed their biological children. Over the next few decades, waitresses began to occasionally be given an additional 15-20% of the bill to keep for themselves, provided that a dairy product was served during the meal. Eventually, people tipping became a part of everyday life, and in many areas, it is considered rude to decline from people tipping. In England, it has also become custom to offer flies a pound or two if they agree to consume your garbage, thus eliminating the need to visit the rubbish dump and dispose of the waste properly. Though it seems harmless enough, fly-tipping can lead to excess littering as many flies will not consume an entire pile of trash and will instead leave it on the curb or in some other unauthorized area. As a result, British officials have attempted to ban fly-tipping, though the practice still occurs in many parts of the country. With cow tipping gaining such popularity, pranks concerning cow tipping are becoming more and more widespread. 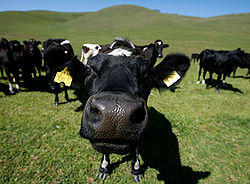 A common prank involves an individual approaching a cow and asking it if it enjoys cow tipping. When the cow answers Moo (Cowese for yes), the prankster attempts to "tip" the cow by pushing it over. However, most cows weigh somewhere between much and a lot, and few attempts of this prank are successful. Other pranks include promising to tip a cow once it is sleeping, with the catch that it must be standing up. Since it is impossible for a cow to sleep while standing, the cow is in effect gypped out of its money.